Lucifer waiting in Stull Cemetery. Stull Cemetery is a small cemetery located outside of Lawrence, Kansas. It is the battleground for the final confrontation between the two archangels Michael and Lucifer. 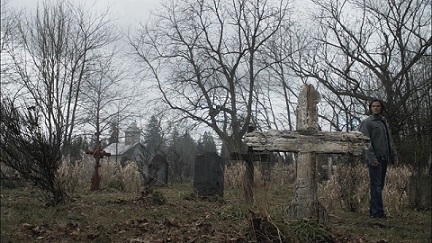 The prophet Chuck Shurley predicts that this ground will host the final confrontation between Michael and Lucifer because everything must end where it began. 1.2 6.01 Exile on Main St.
Lucifer, Michael and Dean at Stull Cemetery. Michael and Lucifer meet for their battle at Stull Cemetery. Lucifer is using Sam Winchester as his vessel, and Michael is using Adam Milligan, the Winchesters' half brother. Lucifer tries to dissuade Michael from the fight, saying it is one of God's tests, and they have no idea what the right answer may be. He suggests they walk away. Michael counters that he must carry out God's orders, and that it's his destiny to kill Lucifer, who is evil. Just then Dean arrives in the Impala, with Def Leppard's "Rock of Ages" blaring. Dean tries to talk to Sam, inside Lucifer, but Michael tells him it's not his fight anymore. Castiel arrives, tossing a molotov of burning holy oil on Michael, banishing him temporarily. Lucifer turns and obliterates Castiel with a snap of his fingers, and then as Bobby shoots him, he snaps the hunter's neck. Lucifer proceeds to beat Dean, taunting him, saying he will kill him slowly and make Sam feel it. Dean doesn't resist, but tells Sam he won't leave him. As Lucifer prepares to land another blow, he glances at the Impala, and suddenly all Sam's memories of life with Dean rush at him, allowing Sam to take control from Lucifer. He tosses the Horsemen's Rings to the ground and recites the incantation to open Lucifer's Cage. He and Dean look at each other one last time. As Sam goes to throw himself in, Michael reappears and tries to stop him, but is dragged in with Sam. As Dean grieves, broken and bloody, Castiel, his life and powers restored, reappears and heals him, as well as resurrecting Bobby. 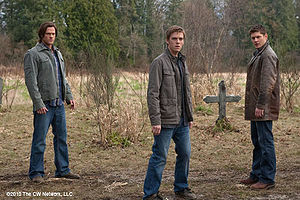 Soon after imprisonment, Sam Winchester is resurrected and wakes up in a rainy Stull Cemetery without Adam. When Lucifer takes Sam on a journey through his memories to show him the kind of person he used to be, Stull Cemetery and their last fight was the second stop they made. There Lucifer tells Sam that, while he doesn't like him, he respects him for how he was able to beat him all those years ago. 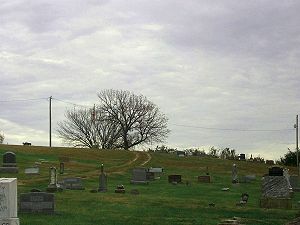 Stull Cemetery is a real cemetery in Stull, Kansas, about 40 miles from where Sam and Dean were born in Lawrence, Kansas. It has a lot of lore associated with it, including that it may be a gate to Hell. Stull Cemetery - photo taken by MissyJack October 19, 2010. This page was last edited on 9 July 2017, at 18:40.